Tingverken systematically invests in modern CAD, CAM and simulation software. The platform for all production is 3D modelled parts and tool designs. The watchwords of the production process are control, measurement and verification. Each part of the manufacturing process is control measured in measuring machines against the 3D material. This principle is an essential condition to ensure the manufacture of precision moulds for both single and multi-cavity tools. All production takes place in the very best modern machinery, large parts of the machinery fleet are integrated in robot-manned production cells where all processing is ongoing and controlled by the overall order management system around the clock every day of the year. 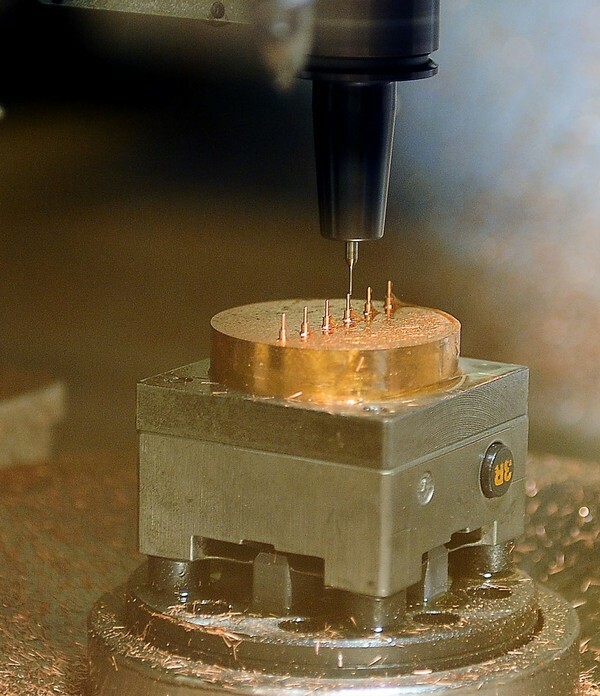 Form set processing takes place in stable and accurate milling machines of the highest class. Electrode manufacture takes place in high-speed milling machines (HSM) integrated in separate processing cells, in order to ensure the absolute best surface finish and the precision of the electrodes intended for the subsequent sinker electrical discharge machining (EDM) of the part’s cavity. Wire electrical discharge machining (EDM) occurs in the best stable, all linear motor driven machines, which is a prerequisite for being able to process high-quality small holes and demanding geometries in steel. Sinker electrical discharge machining (EDM) occurs in high-quality machines that are integrated in separate processing cells, in order to ensure the absolute best surface finish and precision of the final product.